These dryer sheets were painted with acrylics, some spritzed with color mists, then edged with glitter glues. The background is sprayed with color mist as well, and three images of vintage cars added. Some doodling, and washi tape. Hi Chris, I love your painting, you do awesome work! Dryer sheets, fun. I love the recycle idea, Daphne. Very pretty page. 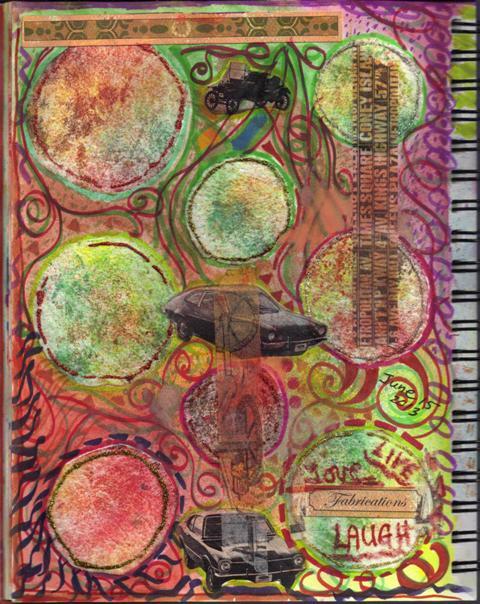 I've used dry used up wet ones to clean brushes and after they get so colorful I"ve glued them into my art journal. Talk about a colorful background. Been away too long. Fun to see what you've been up to.